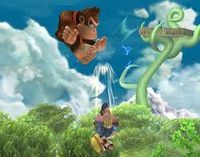 Donkey Kong's forward aerial meteor smash in Brawl. Mario's meteor smash in SSB4. Wolf meteor smashing Falco with Wolf Flash in Brawl. Link's down tilt, one of the few meteor smashes that can only be done on the ground. 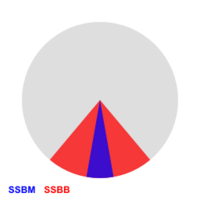 A meteor smash (メテオスマッシュ) is a type of attack in the Super Smash Bros. series that strikes opponents downwards, as opposed to horizontally or upwards like most attacks. Meteor smashes are primarily designed to KO or gimp recovering opponents at especially low damage. With their potential to take a stock earlier than usual, most conventional meteor smashes are somewhat slow to execute or require sweetspotting. Some meteor smashes are not meant for edge-guarding and are done only to knock opponents into other hits of the attack. Other meteor smashes can damage only opponents that are on the ground, making them impossible to send targets downwards. These are known as unconventional meteor smashes. In Super Smash Bros. Brawl, if a meteor smash on a grounded opponent does not induce enough knockback to knock the opponent off the ground, it has a chance of tripping them. In Super Smash Bros. 4, characters that are meteor smashed onto a floor will bounce back up. While this allows certain Final Smashes to incorporate downwards finishers and still result in KOs when used onstage, it also allows players to tech even if they were standing on the ground (unless it is an attack with a very high amount of freeze frames, such as Ganondorf's down air). In addition, stronger meteor smashes are now denoted by a unique sound effect upon connection. Meteor smashes also gained the ability to lock opponents if they don't induce enough knockback to knock the opponent off the ground. In Super Smash Bros. Ultimate, meteor smashes done on players standing on the ground can no longer be teched. In addition, being hit by a meteor smash hard enough to cause tumble causes the victim to be KO'd between the off-camera zone and the bottom blast line, making meteor smash sacrificial KOs reliable ways of securing a win when both players are on last stock. The angles considered to be meteor smashes - blue range is for Melee, red range is for Brawl. Any and only angles within this range count as meteor smashes. As they hit opponents downwards, meteor smashes cause targets that are not in the air to immediately bounce off the ground they're standing on, reducing the knockback received by 20% and thus making such attacks much weaker and less reliable KO moves on grounded targets; if the intended knockback is below a certain amount, it will not even deliver any vertical knockback at all, and instead merely cause flinching and perhaps tripping in Brawl. As a result, only the strongest meteor smashes (such as Ganondorf's down aerial) are viable KO moves in on-stage situations. Regardless, meteor smashes on grounded targets are one of the few moves in the series (especially Melee) that are unable to be crouch-cancelled. In games before Super Smash Bros. 4, if a meteor smash connects on a midair target, the victim does not suffer any sort of bounce effect and will stop their fall, no matter how close to the ground/floor they are on any surface that can block their fall. Because of this, they are able to tech from most meteor smashes with solid timing should they be able to impact a viable surface. In Super Smash Bros. 4, even if the victim is in midair, they will now bounce off the ground regardless if they have sustained a notable amount of damage for the proper amount of knockback power, which is needed for some meteor smashes for programmed reasons (such as most Final Smashes). Despite their reduced power on grounded opponents, the amount of hitstun delivered by a meteor smash is not affected by the knockback reduction, meaning such moves will cause more hitstun than non-meteor smashes with equal knockback. Combined with their vertical trajectory, this results in meteor smashes being excellent combo starters on grounded opponents. Meteor canceling is the act of instantly negating the downwards knockback of a meteor smash by jumping or using an up special after being hit. In Melee, a meteor cancel can be done 8 frames after the hitlag ends, producing a distinctive wind-cutting sound and a sparkle (the character will also briefly glow white); in Brawl, meteor cancels are not indicated and can only be done after 25 frames, though some characters have their own windows. Additionally, any time a jump or up special input is entered before this window, even before the character is meteor smashed, a penalty period of 40 frames takes place during which they cannot meteor cancel; in a similar vein to the tech penalty, this prevents players from simply mashing said inputs to easily pull off a meteor cancel. Characters can meteor cancel even if they were hit while grounded, though they must have bounced off a ceiling and still be taking the now-downwards knockback to do so. Meteor canceling only exists in Melee and Brawl, making meteor smashes in other games functionally equivalent to spikes. In Melee, a meteor cancel after an up special must have the stick return to neutral or some other non-up position before performing the subsequent cancellation up special. If the stick is left oriented up, a meteor cancel is not possible. With the exception of Wolf, the different meteor cancel windows are justified; characters that rely on tethers (or a sub-par up special in Yoshi's case) have faster meteor cancel windows, while characters with multiple jumps and the ability to glide have slower meteor cancel windows. 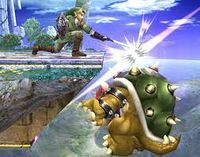 A meteor smash is not to be confused with a spike; while spikes also have downwards knockback angles, they are diagonal enough to not be recognized by the game as a meteor smash, and thus cannot be meteor cancelled. Despite this, many smashers use the term "spike" to refer to meteor smashes, with the term "true spike" referring to spikes. Meteor smashes are also not to be confused with a stage spike, where attacks with standard knockback angles can cause opponents to bounce off the underside of a stage and fly downwards, unable to meteor cancel. Not all characters have access to a meteor smash (e.g. Pikachu in the first three games). The characters that can meteor smash and their respective meteor smashes are listed and described here. Some items, such as Moltres and the streams of a Super Scope, as well as the attacks of some bosses, also have meteor smash hitboxes, but they are not listed here. Spikes and semi-spikes, due to their differing properties, are not listed here. This list does not include unconventional meteor smashes. Spike – an attack that sends the opponent downwards yet cannot be canceled. Semi-spike – an attack that hits the opponent at a very low horizontal angle, minimizing recovery opportunities. 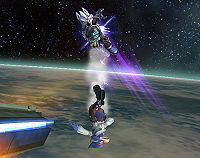 Footstool jump – a technique from Brawl onward which makes a character jump on their opponent's head. If done on an aerial opponent, it causes them to fall downward. This page was last edited on January 7, 2019, at 21:57.